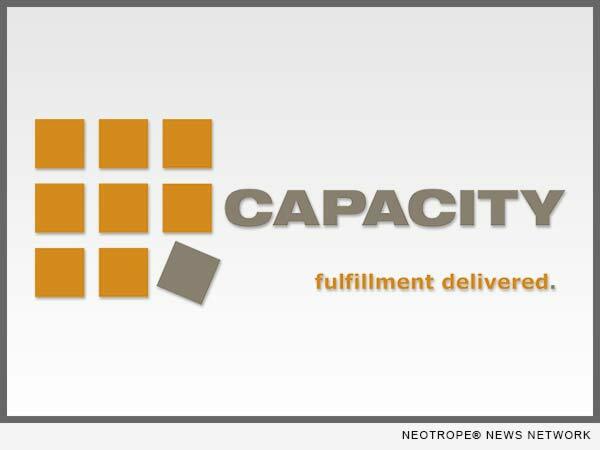 Capacity LLC, trusted leader in order fulfillment, e-commerce, and electronic data interchange (EDI), has secured the intellectual property rights to its signature tagline, “fulfillment delivered.®” The company’s trademark application was approved earlier this year, officially confirming what clients already know: Capacity is a modern order fulfillment partner in a sector that often clings to outdated practices. This comes at a time when aging industry identifiers like 3PL and logistics provider are not consistent with the core capabilities that Capacity provides clients. “fulfillment delivered.®” zeros in on Capacity’s core mission of excellence in order fulfillment. Two simple words clearly communicate Capacity’s ability to deliver diverse, flexible order fulfillment for a digital world. “The company brand name itself needed something more to bring clarity to those services we provide: a powerful tagline was crucial,” says Marketing Director Rich Reba. With the approved, registered trademark, Capacity now owns the rights to the phrase to strengthen their company’s brand identity. For more information about Capacity, visit http://www.capacityllc.com/. Anyone interested in discussing outsourcing order fulfillment can also contact Capacity’s fulfillment experts online at http://www.capacityllc.com/contact, or call (732) 745-7770 and select option 3. Since 1999, Capacity LLC has been offering expert order fulfillment services, warehousing, value-added services, assembly services, and technology solutions to businesses globally. Capacity LLC provides a bicoastal fulfillment solution, from four facilities in North Brunswick, N.J., and a fifth in City of Industry, Calif. These strategic locations on both coasts allow for reduced transit times, cost-effective shipping, and more flexible transportation solutions. All five facilities are close to the major ports of Los Angeles/Long Beach and Newark/New York.